Previously, I mentioned my plans to make each of the major costumes from Andrew Lloyd Webber’s The Phantom of the Opera. First, the Hannibal Ballet costume and the matching “Think of Me” skirt. These are now done and I will be posting their sewing diaries shortly. Meanwhile, I’m planning the next costume: the iconic white dressing gown, which is worn during the title song, while the Phantom takes Christine down to his lair beneath the Opera House. The white jacquard dressing gown is deceptively simple. It consists of a long A-line skirt that’s gathered at the center back with a short train. The bodice crosses over and ties shut. 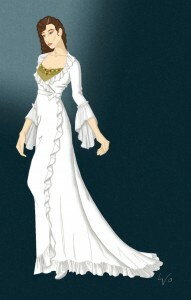 The sleeves are elbow-length with lace flounces. 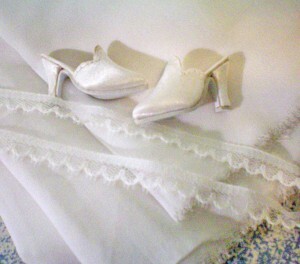 The edges of the dressing gown and its hem are flounced and trimmed with lace. For the doll, I’ll be using a 15.5″ Gene Marshal “Simply Gene” vinyl fashion doll, which has blue eyes and long brown hair. I plan to repaint her eyes and makeup to give her a more natural appearance, and also to boil perm her hair, to imitate Christine’s spiral curls. Finding a jacquard fabric with a small enough design would be difficult, if not impossible, so I’ve opted to use a plain white georgette lined with silk habotai. I found a very narrow lace to edge the flounces with. And I bought a pair of white satin court mules to finish the costume off. I’m looking forward to making this costume! This entry was posted in Sunday's Someday Projects and tagged Dolls, Lingerie, Phantom of the Opera, Replica, Sunday, Victorian. Bookmark the permalink. Hi! I want to make a life size version of Christine’s dressing gown and I was wondering if you know of a good pattern to use! And also, what would you say is a good, reasonably priced sewing machine? I’m looking for a new one. Thanks! The sewing machine I recommend to my students is the one I use myself, the Singer Stylist. It’s rubbish at zigzagging, but it makes beautiful buttonholes and overlock stitching, and it comes with a ton of different presser feet. You can find it in my Notions Shop. As for Christine’s dressing gown, I’m afraid I don’t know of a pattern that’s identical. You would have to mix and match and do a lot of alterations to get something that works. Truly Victorian has the 1893 Bell Skirt that could be altered for the skirt half of the dressing gown, and the 1870 Blouse Waist could maybe be altered for the bodice. Hope this helps! Thank you! That helps a lot! If I have any other questions I’ll make sure to ask you!